As soda consumption softens, Coke is expanding its fruit-juice and tea brands. 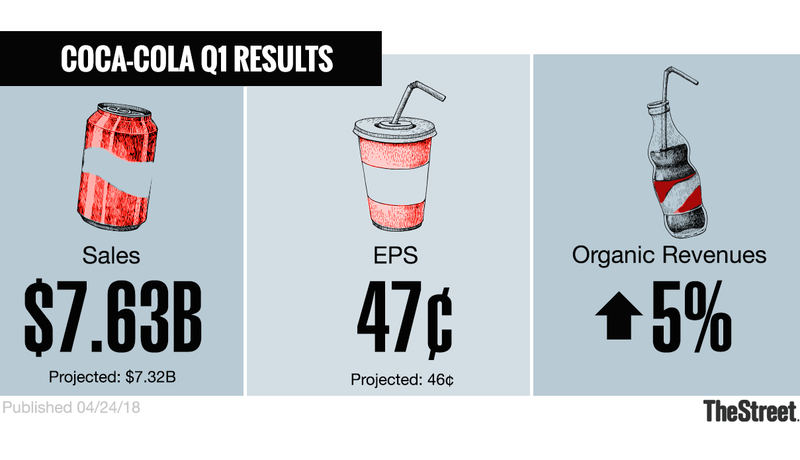 The Coca-Cola Company (KO - Get Report) is going healthy. The soda conglomerate crushed its first-quarter results Tuesday, April 24, reporting organic sales growth of 5% and beating Wall Street projections for both earnings per share and revenue. Coke's recent growth, however, was driven largely by beverages outside of its eponymous brands, though Diet Coke generated volume growth, thanks to its recent repackaging campaign. In its report, the company underscored its expansion strategy and hinted at further deals to come. The latest stars under the Coke banner are its noncarbonated drinks. The Fuze Tea brand, for instance, was recently introduced in Europe, the company said. Overall, while its sparking soft drinks posted 4% growth in unit case volume, the tea and coffee category grew 5% and juice by 3%. Coke continues to set its sights on expansion, CEO James Quincey told analysts in the earnings call Tuesday, despite the higher pressures on margins that come with newer brands. One example is Fuze, he said, a brand the company has been growing since its acquisition in 2007. "We've effectively doubled the value of the Fuze brand [as] we will be able to build the equity around the brand, keep it relevant for consumers, keep the innovation going," he said. "Then that will allow us to get to scale and ultimately the margin structure to make it comparable to sparkling and, of course, then we will likely choose to reinvest in the next brand we're growing." Quincey told TheStreet in February the company is moving even faster to innovate. In other words, Coke will continue this cycle of expansion for future targets, especially as demand for carbonated drinks diminish and fruit-juice or tea drinks ascend in popularity. Coke's most recent acquisition was Chilean canned fruit-juice company Comercializadora Novaverde Ltda. It announced the deal in early January. Coke's other tea and juice brands include Suja Life, Honest Tea and Odwalla. In North America, in particular, Coke's growth was largely led by sparkling waters. It posted double-digit growth in its sparking beverages under Smartwater and Dasani, as well as the La Croix-competitor Topo Chico, which it acquired in October. "We are shaping and expanding our portfolio through innovation, expansion of the lift-shift-and-scale model, and bolt-on M&A, all being driven by disciplined approach to growth," Quincey said. Coke shares closed down nearly 1% in Tuesday trading, at $43.07. For the first quarter in 2018, the company posted earnings of 47 cents per share — higher than the projected 46 per share according to Factset — and total sales of $7.63 billion, which is also higher than the anaylst prediction of $7.32 billion.